Sacrifice is a Terror Witch Doctor skill unlocked at level 13. One of the Witch Doctor's biggest damage skills, Sacrifice causes the Witch Doctor's Zombie Dogs to explode, dealing substantial damage to nearby enemies. As the actual Mongrels deal very weak damage with their attacks, and tend to die quite quickly on higher difficulty levels, their best utility is often to die in a blast of glory. When combined with some of his passive skills, this spell can deal the highest damage of any Witch Doctor attack, though it must be used cleverly to yield such rewards. The various passive skills and rune effects that enable new Zombies dogs to spawn automatically are important to investigate when considering this skill, since the actual Summon Zombie Dogs skill has such a lengthy (60 second) cooldown. The Witch Doctor dispatches his zombie dogs if they are of no more use to him. The following is a very quick summary. See the Sacrifice rune effects page for a more thorough description of rune effects, or any of the individual rune pages for numbers, screenshots, blue quotes, and much more. The explosion in which the dogs are sacrificed is magnificent, and can easily take out multiple enemies if timed and positioned correctly. A sequence of images showing sacrifice. This skill can only be used when the Witch Doctor has Zombie Dogs available, provided from either the active skill Summon Zombie Dogs or the passive Circle of Life. 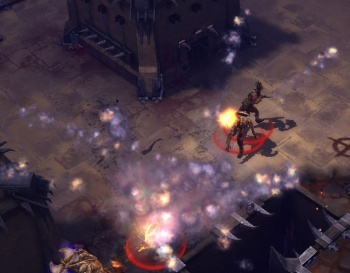 Sacrifice premiered with Diablo III in the WWI 2008 gameplay video, and was a Tier II skill in the Voodoo Skill Tree. For BlizzCon 2009, Sacrifice was moved to the Zombie Skill Tree, but was otherwise unchanged. The biggest damage skill he had, and one I made extensive use of. It was especially good late game, when hunting down the last Wizard. I’d chase with the dogs ahead of me, hurling Firebombs at, or just to cut off, the Wizard. As soon as one of the dogs got in range, even if it was just close enough to take one swipe at the running target… bang. Skill tiers were removed shortly before the beta started in September 2011, and Sacrifice became a level 16 skill. The skill system was once again overhauled for the Beta Patch 13 in February 2012, and Sacrifice was classified as a Terror skill and moved to level 21. For Beta Patch 14, it was moved down to level 13, within reach of the beta players. Unfortunately, there have been no beta gameplay reports detailing the use of this skill. See the Witch Doctor skill archive for more details on previous versions of Sacrifice and other Witch Doctor skills. Mongrel detonation in the Arena. This page was last edited on 7 June 2012, at 01:06.